The EarthCraft Celebration of Excellence took place on Friday, October 21, 2016 at the Southface Eco Office. The awards honor the builders, contractors and developers who are committed to building a more sustainable, high performance, built environment. More than 70 green building professionals attended this year’s event to celebrate the best that EarthCraft has to offer. 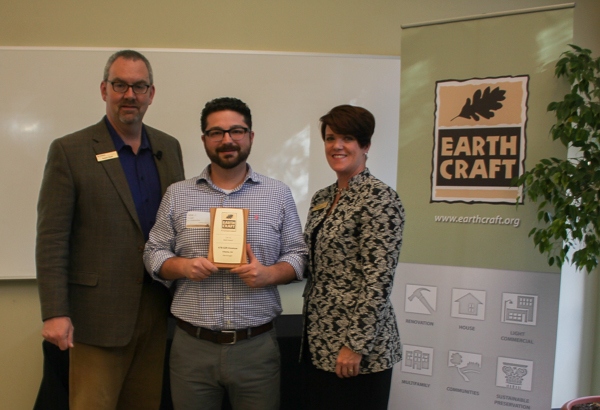 Abe Kruger receives the EarthCraft Design Award from Southface’s Marci Reed and Robert Reed. The 2016 Awards were given in three overall categories: Achievement Awards, High Performance Awards, and Design Awards. I’m excited to announce that the Green on Gift house was presented with a Design Merit Award! This award would not have been possible without the tremendous support of sponsors, friends, and family who all made the renovation possible. The Greater Atlanta Home Builders Association publishes a quarterly magazine called Atlanta Building News (ABN). ABN recently featured an article written by Southface about the Green on Gift home. The article focuses on how we used the home to educate the public and spread the green building gospel. The Green on Gift project has always been about more than just making one home as green as possible. We want to showcase innovative techniques and products to help others improve their homes as well. Thanks for the great support GAHBA and Southface! Now that the home is certified, it’s time to catch up on some blog writing! I frequently get asked about the appliances. After extensive research, we opted to use Bosch kitchen and laundry appliances. Bosch was a logical choice because they manufacture energy efficient and well designed equipment. The one exception is the range hood, which Bosch had on back order and we couldn’t wait, so we chose a stainless steel Whirlpool model instead. Selecting appliances involves a number of factors, including energy efficiency, aesthetics, size, warranty, and cost. For the Green on Gift home, all appliances obviously needed to be ENERGY STAR qualified. We also had space constraints for the refrigerator, which needed to be counter-depth, and stacking laundry, which needed to fit into a specially constructed laundry closet in the bathroom. One of the overarching project goals was to balance energy efficiency and home performance with usability. For instance, we wanted to try out condensing clothes dryer technology, which is not terribly common in the United States and functions without an external vent. Conveniently, Bosch is a leader in condensing clothes dryers, and they also stepped up as a project sponsor. An essential component of the renovation process was obtaining green building certification with third party verification. From the start, I wanted to practice what my company preaches to our clients – incorporating green into all decisions from design through construction and ultimately occupancy. We tested the ductwork and envelope multiple times to maximize building performance. Today I’m pleased to announce that the Green on Gift home was awarded EarthCraft Platinum certification with one of the highest point totals in the program’s history! 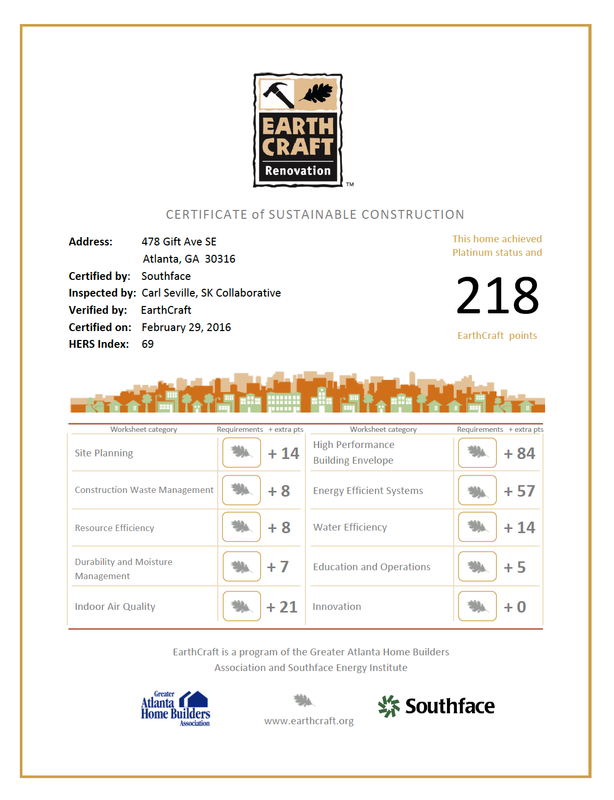 Southface, an Atlanta-based environmental nonprofit, and the Greater Atlanta Home Builders jointly developed the EarthCraft program 15 years ago. Since then, over 30,000 multifamily units and homes have been certified across the southeast. While there are numerous green building certification options available, the EarthCraft renovation program is by far the most robust and flexible option for builders; and as a former Southfacer, it felt good to support the program. Window replacement typically has a poor economic payback, which I am very aware of as a green building consultant. I tell clients that windows are replaced primarily to improve comfort and aesthetics, and that’s been mostly true for my house too! The existing wood windows were single pane and in pretty rough shape. Since we were already gutting the house, the incremental costs of window installation were relatively modest. The new windows certainly help improve the home’s energy efficiency, but they also look much better and help the house feel more comfortable. The Green on Gift home presented several challenges when it came to replacing the windows. For one, the sizes are not standard, so we had to special order the new windows. Because the house has a complicated history with water, we wanted to select windows that were as durable and rot-resistant as possible to further prevent any potential issues, especially for the windows in the showers. Finally, the existing windows were also supporting the bricks above them, since the original builder neglected to install traditional supports like steel angles or lintels. As you might suspect, windows by themselves are terrible structural supports. We came up with a creative way to solve this problem, but that’s another (future) blog post! Utility Bills Cut in Half! I must say the new year is off to a pretty great start. The Green on Gift renovation is officially complete! There is still a fair amount of work to do on the landscaping, but the interior of the home has been finished for a little while–sorry for the lack of updates! To help commemorate this milestone, we just received our rebate check from Georgia Power’s Home Energy Improvement Program, which we nearly maxed out! Georgia Power offers a range of rebates to help their customers reduce their energy consumption. There are two pathways to savings. You can either select improvement measures à la carte through the “Individual Improvements” path or go the “Whole-House” approach. Individual improvements can include air or duct sealing, installing a programmable thermostat, or upgrading your home’s insulation, among other things. The whole-house approach includes a detailed home energy assessment with estimated energy savings. This is a service my company, SK Collaborative, provides, so of course I had to try it out on my own home! The energy model estimates that the renovation will reduce energy consumption by 53.1% and that we’re saving $1,235 annually. Below is the breakdown in how we’re achieving these savings. A couple of weeks before I was to move into the house, I got a late night call from my soon-to-be next door neighbor. We had been in contact since the beginning of the renovation to discuss logistics and to make sure construction wasn’t impacting them too much, so the fact that he was calling wasn’t unusual. The late hour, however, made me a little nervous. It was one of those alarming calls that starts with a drawn out “soooo…” followed by a “no one was hurt.” As it turns out, half of a large, forked oak tree had fallen from the back right corner of my lot and landed in the backyards immediately and to the left behind mine. This is how I met the neighbors behind my house. Friendly! Although we opted to keep the air source heat pump at the Green on Gift house, we have completely updated the duct system. Here I walk you through the many improvements we made to the Heating, Ventilation, and Air Conditioning (HVAC) systems at the Green on Gift house. The Heating, Ventilation, and Air Conditioning (HVAC) systems at the Green on Gift house left much to be desired. Previously I discussed the Top Ten HVAC Problems, but in case that was a little abstract, here’s a video of me walking us through most them. All videos come from Tom Mills with Green Shortz. Part two showing the new duct system from Sosebee Services will be up soon! Last week we hit another milestone – the hardwood floors are patched, sanded, and stained! The house originally had a furnace and central air conditioner in the crawlspace, so we patched the holes for the old floor registers. We had originally wanted to save the kitchen floors, but the water damage was so extensive that it made more sense to start fresh with new floor boards. We were, however, able to re-use some of the kitchen flooring to patch other areas in the house. Here’s the kitchen during demo and then with the new floor just before we installed the cabinets. Kitchen mid-renovation with brand new floors. What happens when a green building expert renovates a small home on a tight budget? Abe Kruger, cofounder and principal at SK Collaborative, has set out to answer this question! The Green on Gift home will showcase green products and strategies. Sawhorse, the premiere green renovation firm in Atlanta, has been selected as the general contractor. The whole renovation process will be publicized here, in articles online and in print publications, and videos. Please contact Abe Kruger to get involved with the project.